Aviva Career Opportunities Available Now! Use your skills and passion to make a difference in the lives of seniors and their families. As part of the Aviva family, you’ll find growth opportunities, competitive benefits and competitive compensation plans. 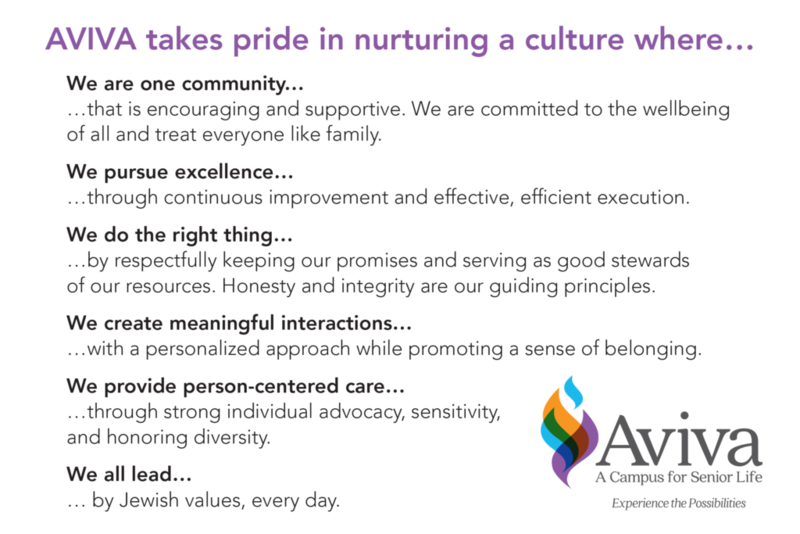 At Aviva, we cultivate an environment where our residents and staff feel special, safe and appreciated. This extra effort produces an atmosphere of hospitality and customer service that is unrivaled in our region! Along with competitive salaries, a 403B retirement plan and benefit program, Aviva encourages personal and professional development. Every position plays an important role and strengthens the team! Aviva considers all applicants for employment without regard to race, color, religion, gender, sexual orientation, national origin, age, handicap or disability, or status as a Vietnam-era or special disabled veteran in accordance with Federal Law. In addition, Aviva provides “reasonable accommodation” to qualified individuals with disabilities, in accordance with the Americans with Disabilities Act (ADA) and applicable state and local laws. Aviva selects employees based on the skills, ability, education, training and experience to perform each job. It also is our policy to ensure equal opportunity in hiring, promotion, compensation, training, transfer in all terms conditions or privileges of employment.